Although the salty sea air is a somewhat challenging environment for most plants, just even a bit of shelter provides the chance for trees and shrubs to grow. Against the promenade stands the open space that’s Jubilee Gardens. A big open field with a playground for small children and a skate park and multi-use court for teenagers, it’s a well used resource by local youngsters. Like we said, the wind blowing straight off the Irish Sea makes growing most plants somewhat challenging, but it’s a green field at the very least. 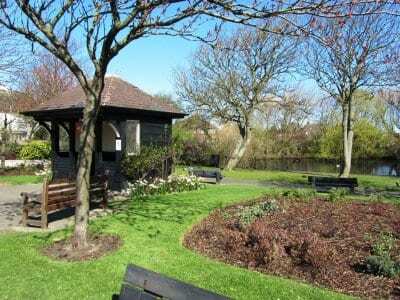 Head along Victoria Road West and you pass the pretty duck pond with the little shelter and flower beds. Technically too small to be a park, but a lovely welcome to the town nonetheless, and pretty as a picture as part of the In Bloom trail. At The Towers, hidden from view behind West Drive, Holmfield Avenue and Amounderness Way is an urban woodland that volunteers are trying to regenerate. Of course don’t forget the largest park of them all at the Wyre Estuary Country Park. On the banks of the River Wyre at Stanah just on the edge of Thornton, it’s a wildlife haven and perfect for country walks. All over the area are small patches of grass, fields, verges and well maintained roundabouts, each of them a haven for the wildlife that lives there.